The Salina Police Department’s “Coffee with a Cop” is back. According to the City of Salina, it is one of of the most successful community orientated policing programs. This community orientated event allows individuals an opportunity to ask questions and voice concerns. It is also a great way to get to know the officers that are serving their community. This national initiative aims to improve relations between the community and its officers. 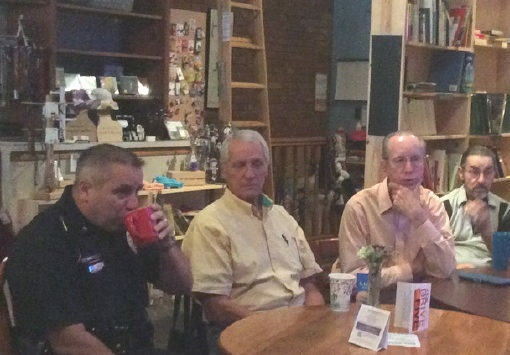 “Coffee with a Cop” was introduced to the Salina community by Police Chief Brad Nelson in 2014. The Salina Police Department has since hosted over a dozen Coffee with a Cop events. Everyone is invited and encouraged to participate in this event. The next “Coffee with a Cop” will be this Friday, December 8th, from 8 a.m.-9:30 a.m. at Ad Astra Books & Coffee House, 141 N. Santa Fe Ave.